Sounding rocket RX320. Image courtesy of LAPAN. Indonesia’s space agency LAPAN has announced its aim to launch an indigenous orbital rocket by 2040, with the ability to insert a 1-tonne satellite into Low Earth Orbit (LEO). The announcement was made during a briefing in preparation for Indonesia’s Aerospace Summit, scheduled to take place on 25-26 September 2018. According to LAPAN, the agency is currently undergoing an evaluation of its activities from 2016-2020, and says it has a clear direction of what it wants to accomplish. It has already selected two locations – Biak Island in Papua, and Morotai Island in North Maluku – as potential launch sites. The first phase, which it is currently undergoing now, aims to develop a launch vehicle capable of delivering a 50kg payload into an altitude of 300km. The launch vehicle for this phase will be a 3-stage, solid fuel rocket. Phase 1 is expected to be completed in 2019-2020. Following that, LAPAN will begin its second phase, which will aim to add strap-on boosters to the vehicle, in order to increase the rocket’s thrust and payload capability. This will enable the vehicle to take 100kg to an altitude of 300km. The programme’s third phase will develop a liquid propulsion engine, to be used in conjunction with its solid-fuel strap-on boosters. Phases 2 and 3 are expected to take 10 years, and be completed by 2029, with the provision to extend Phase 3 if necessary. By the end of Phase 3, LAPAN should have a launch vehicle capable of taking 100kg to a 600km LEO. The final phase of LAPAN’s planned rocket development programme will begin in 2029, where the agency will work on the rocket’s exact specifications and orbital insertion capabilities. The targeted completion date of the vehicle is 2039, with its launch to take place at Indonesia’s new launch complex in 2040. 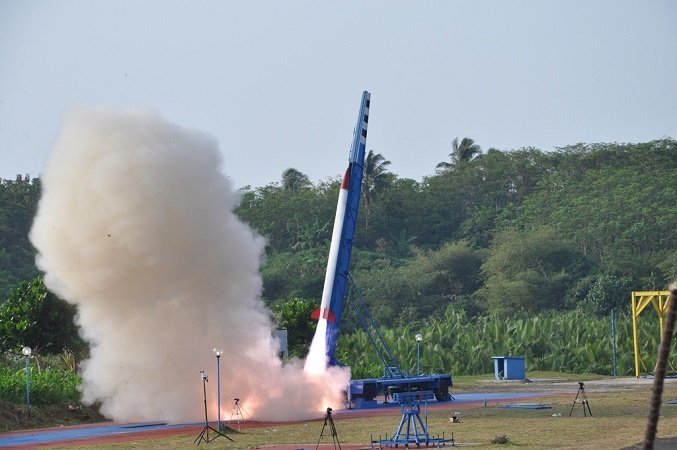 At the moment, LAPAN has a series of sounding rockets which it tests on a regular basis, including the liquid-propellant sounding rocket Rukmini (RCX1H-1). These have been developed with a view to use them as individual stages in Indonesia’s planned orbital rocket. Concurrently, LAPAN is conducting a satellite development programme, beginning with an indigenous microsatellite programme meant to lead to an operational remote sensing satellite by 2025. Correction: Biak island is not in Papua New Guinea (which is an independent country), but rather the Indonesian province of Papua. PNG and Papua are on the same island (New Guinea) and the western half is Indonesia’s Papua province, while the eastern half is the independent country, PNG. Thanks for pointing it out – it’s been edited.